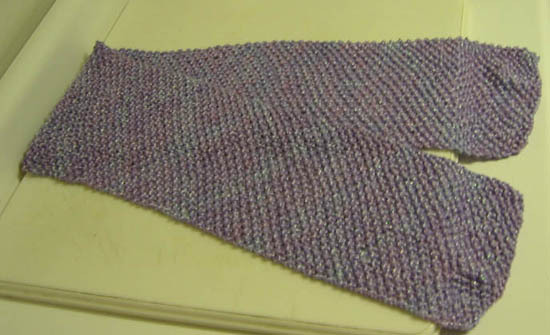 One of the (many) things that I love about knitting is the opportunities for fanciful projects. My mother has been an absolute saint for, well, my entire life... but never so much as the last few months. I decided to knit her up something small in gratitude. I went by my LYS, and they were having a trunk show of Cinnamons Dye Pot hand-painted yarn, including a large selection of their Shimmer yarn (scroll down). It's a beautiful, slinky yarn -- and knowing that my mother shares my love of all things whimsical, I grabbed two skeins in a pretty liac and blue blend. 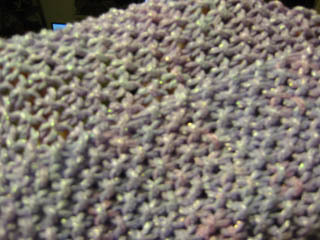 I did a moss stitch on size 13 needles -- I cast on 15 stitches and just knit until I ran out of yarn.